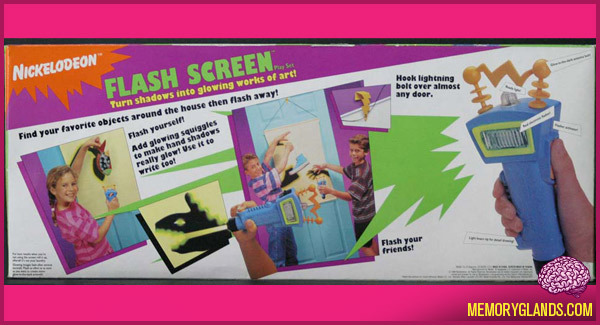 The Flash Screen was meant to be played in a dark room and included a white glow in the dark poster with a two in one “Zapper” which featured a camera flash top with flashlight bottom. The user would turn on the camera flash and leave a shadow silhouette of themselves on the white poster emitting a green glow. The user can then take the flashlight pen and draw on their silhouette. The toy was eventually canceled due to claims of health hazards with children experiencing seizures due to staring at the flashbulb too much.